Welcome back to The Professor, a weekly guide to what we learned in college football. For more from Week 6 in college football, catch up on scores here and check out our five takeaways from Saturday night. Many of college football's greatest rivalries get part of their appeal from anticipation. The Iron Bowl, Ohio State-Michigan, Army-Navy -- these series wait until the end of the regular season, showdowns that the entire fall schedule builds toward. That's not the case for Miami-Florida State. The Seminoles' final regular-season game is reserved for its other in-state rival, Florida. That means that Miami's chief rivalry is played earlier in the season, with no set annual date. It floats around from September to October to November, and whenever it falls, it's almost as if Miami has two seasons every year: before FSU and after FSU. For the first time since 2009, Miami's first season ended in a victory. With the game pushed back three weeks because of Hurricane Irma, Miami finally traveled to Tallahassee on Saturday afternoon for the annual showdown with the Seminoles, and the result was yet another memorable finish in a rivalry historically known for down-to-the-wire results and agonizing losses. Miami won 24-20, sending the Seminoles -- who are far more talented than their record indicates -- to their third loss in four games to start the season. Florida State went ahead on a 20-yard touchdown pass from James Blackman to Auden Tate with 1:24 left, and Miami hoped to at least drive for a field goal to force overtime. It got more than that, as quarterback Malik Rosier led the Canes down the field with the help of Braxton Berrios and Travis Homer. On first down at the 23-yard line with 11 seconds left, Rosier fired to Darrell Langham short of the end zone, and Langham broke over the goal line for the winning points. The victory ended Miami's seven-game losing streak in the rivalry, and it ended Jimbo Fisher's perfect record against the Hurricanes as head coach of the Seminoles. It ended an agonizing run of heartbreak, too, as the past three meetings and four of the past six were decided by five points or less, including a 20-19 FSU win last year after Miami's late PAT was blocked. In fact, the two have met 19 times since 2000, and 15 of those games have been decided by eight points or less, continuing a theme that's been present for much of the rivalry. Seven of Miami's 32 wins have been by a single point. About half the games have been decided by eight points or less. It is an exhausting, emotional in-state rivalry, one that can't help but take a lot out of both teams. For Miami especially, though, it's merely a beginning. Miami, which is 4-0 and just won its toughest ACC road game, must move on and ensure that the opportunity created by winning in Tallahassee will not be wasted as the Canes seek their first ACC Coastal title since joining the conference in 2004. Moving forward first requires dealing with some unfortunate news from the weekend: Standout tailback Mark Walton will miss the rest of the season with an ankle injury, a tough blow to take, given that Walton was the ACC's best returning running back. The likely next starter is Homer, a sophomore who provided what Miami fans hope is a glimpse of things to come with runs of 10 and 14 yards in the final minute to set the stage for Rosier's winning touchdown pass to Langham. Injuries have been an issue, as star receiver Ahmmon Richards has also been limited by a hamstring problem, but despite those hang-ups, the Canes move forward with the most confidence this program has had in years. At No. 11 in this week's AP top 25 -- No. 8 on my ballot -- Miami is the only Power Five team in Florida that is ranked, as Florida State and Florida are both outside. (UCF and USF are both in.) It is viewed as the second-best team in the ACC behind Clemson, and it does not have to meet the Tigers -- or Louisville or N.C. State -- in the regular season. Miami has tough remaining home dates with Virginia Tech, Notre Dame and, on Saturday, Georgia Tech, but it has one of the nation's best defensive fronts and an improving quarterback in Rosier, who has thrown for 1,074 yards with 11 TDs and three picks and made several big throws in the second half of the FSU game against a talented secondary. Last year, Miami lost three games in a row after the FSU heartbreak. In 2014, it lost three in a row to end the season after losing to FSU. In 2013, it started 7-0, lost to FSU and finished 9-4. It's been eight years since we've seen how Miami responds to a win over Florida State. Saturday's dramatic finish will etch its own place in the lore of this storied rivalry, but how the game is remembered is contingent upon what the Hurricanes do to take advantage of it over the next several weeks as they try to return to national prominence. Nobody is happier when he's unhappy than Saban, which made an up-and-down 27-19 win at Texas A&M just what he needed. After Alabama beat Vanderbilt 59-0 and Ole Miss 66-3, Saban had to stretch to find things to be critical about, and the two routs to open SEC play resulted in countless stories written about how dominant this team is. "I'm trying to get our players to listen to me instead of listening to you guys," Saban told reporters after the game. "All that stuff that you write about how good we are and all that stuff they get on ESPN is like poison. It's like taking poison. Like rat poison. I'm asking them: 'Are you going to listen to me or are you going to listen to these guys about how good you are?'" Of course, Saban is also the coach who annually -- often at SEC media days and/or the playoff -- tells the media that he appreciates what writers do and the positivity they can provide for players. "Even though sometimes you think I'm not in your corner, I certainly do appreciate everything that you do to promote our game and the players who play it," Saban said in July. 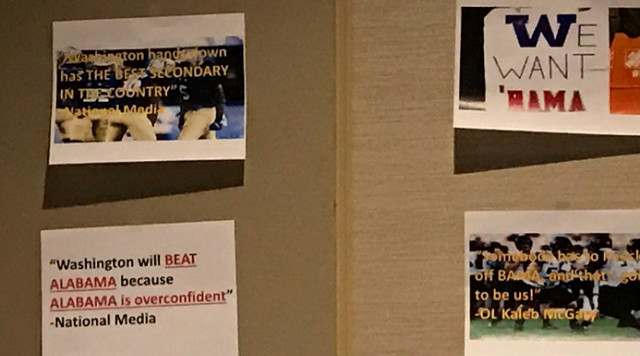 Saban, of course, would much rather the media provide bulletin board material instead of all the positivity so Alabama doesn't have to invent negativity for motivational purposes. The story of the past year at Penn State has been an offensive revolution led by coordinator Joe Moorhead, quarterback Trace McSorley and Heisman candidate tailback Saquon Barkley. All the justified attention to devoted to Barkley and the Nittany Lions offense has, however, overshadowed what's been a sterling performance by the defense under coordinator Brent Pry. In Saturday's 31-7 win at Northwestern, the Wildcats devoted much of their attention to trying to hit Barkley as soon as he got the ball. They succeeded, at least until he broke off a 53-yard touchdown run in the second half. While Penn State tried to get Barkley going, the defense ensured that the result would not be in doubt. The Nittany Lions forced three turnovers and held the Wildcats to 3.6 yards per play. In six games, Penn State has allowed a total of 54 points. The defense ranks first in scoring defense, fifth in yards per play allowed, first in takeaways, third in the red zone and fifth in tackles for loss per game, with a speedy unit flying to the ball and consistently preventing opponents from finding a rhythm. It's made this look like a complete Penn State team, one worthy of its first No. 3 ranking since 2008. Make no mistake: It's a position TCU has earned. The Horned Frogs shut down Arkansas on the road in a 28-7 win. They won on the road at Oklahoma State, 44-31. And after Oklahoma melted down and lost to Iowa State 38-31 at home on Saturday, TCU responded by beating West Virginia 31-24 in the day's only game between ranked opponents. TCU is 5-0, the only Big 12 team with a perfect record overall. It has already cleared two of the biggest hurdles on its Big 12 schedule, too. However, it's hard not to get the feeling that this is going to be a chaotic season in the Big 12. The league has drawn criticism in recent years, but it feels deeper than it's been, with nine competitive teams. (Sorry, Kansas.) Iowa State just won at Oklahoma, a team that convincingly beat Ohio State on the road in Week 2. That's after Baylor, which is winless but improving, gave Oklahoma a tough game. Texas Tech appears to be improved, too, Texas is getting its act together and so on. The Big 12 has a nine-game conference schedule, plus the return of the conference championship game. The Horned Frogs still have four conference road games at Kansas State, Iowa State, Oklahoma and Texas Tech, none of which are easy wins. They also host Texas and rival Baylor. It's not an easy road the rest of the way, and Saturday's result at Oklahoma showed us that nothing can be assumed in this conference. The Big 12 is clearly better in terms of depth. Partly because of that, the feeling that lingered in the preseason is still present now: The return of the Big 12 title game is going to backfire on the conference in the playoff race, isn't it? Michigan State has been a top-25 team in six of Mark Dantonio's 10 seasons. Despite last year's horrific plunge to 3-9, it has been a top-six team three of the past four years. Although there were plenty of clear signs that the Spartans were on the way down, from last year's record to off-the-field troubles to a young roster to Michigan's ascent, the Spartans reminded us all on Saturday night that they're still capable of being a factor in the Big Ten, even if they're unlikely to be the contender that they were a few years ago. After a sloppy performance in a loss to Notre Dame, the Spartans have bounced back to beat Iowa 17-10 and upset Michigan 14-10, with a combined turnover margin of 7-0 in those games after starting the year -6 in the first three. They were aided by the wet weather, but they had to play in the same weather as the Wolverines and avoided making the same mistakes. Through five games, the Spartans are ninth in yards per play allowed, and strong defense and avoiding mistakes can win them plenty of games against their remaining schedule, which features Minnesota, Indiana, Northwestern, Maryland and Rutgers. There will be no danger of missing a bowl this year. The bigger question is what the Spartans can do against Penn State and Ohio State after already beating Michigan. Both the Nittany Lions and Buckeyes are better than Michigan State, but Penn State has to visit East Lansing on Nov. 4, the third leg of a tough stretch that includes Michigan at home and Ohio State on the road the two previous weeks. Michigan State then goes to Ohio State on Nov. 11. They're likely wins for Penn State and Ohio State, but what happened in Ann Arbor emphasized that they can't be chalked up as definite wins. Through five games, Love set a torrid pace, cracking the 1,000-yard mark and breaking off 14 runs of 30-plus yards, more than anyone had all last season. It was the type of production that was unsustainable, as he rushed for 564 yards in his past two games against Arizona State and UCLA.
.@Blovee_20 takes it to the ! The 2017 season has not yet reached its midpoint, but it's likely that Week 6 produced a game that will go down as both the longest and highest scoring of the year. And it also may go down as the game that produced the most memorable touchdown celebration. Buffalo scored a touchdown and kicked an extra point to start overtime. On its ensuing possession, Western Michigan scored with a 14-yard touchdown catch by Donnie Ernsberger. Mistakenly thinking the catch had won the game, his sister, Shalene, ran out onto the field and celebrated with him. "I was astonished that she got down there so fast," Ernsberger told the Buffalo News. "I was in disbelief that she was there before all of my teammates." It would take six more overtime periods for them to actually win on Jarvion Franklin's 12-yard touchdown run. Air Force won the Commander-in-Chief's Trophy after double-digit wins over both Army and Navy last year, and despite having a memorable season, Navy saw its long winning streak against Army end, too. Wanting some payback, Navy has started the series off on the right track this year. Against a rebuilding Air Force defense, Navy jumped out to a 28-7 lead and led 38-17 in the third quarter. Air Force rallied, though, and it took the lead on a 51-yard touchdown pass from Arion Worthman to Marcus Bennett with 1:53 left. Navy ran 11 plays in just 1:38 in response, going 75 yards with Tyler Cameron scoring the game-winning touchdown. Navy won 48-45, in a game in which the teams combined for 1,178 total yards -- 811 of which came on the ground. QB: Khalil Tate, Arizona. Tate didn't even start, and yet he came off the bench when Brandon Dawkins was injured and set the FBS record for single-game rushing yards by a quarterback, previously held by Northern Illinois' Jordan Lynch. In a 45-42 win at Colorado, Tate rushed for 327 yards and touchdowns of 58, 28, 47 and 75 yards on just 14 carries. He also completed 11 of 12 passes for 142 yards and a TD. RB: Jonathan Taylor, Wisconsin. Taylor continued a fabulous freshman season with 249 yards and two TDs on 25 carries as the Badgers beat Nebraska 38-17. He has two 200-yard performances in his first five college games. RB: Kerryon Johnson, Auburn. Johnson is stealing the show in the Auburn offense now with Kamryn Pettway bothered by an injury. Johnson ran 28 times for 204 yards and three TDs in the Tigers' 44-23 rout of Ole Miss. WR: Anthony Miller, Memphis. Miller torched UConn for 15 catches for 224 yards and four of QB Riley Ferguson's seven touchdown passes in a 70-31 win on Friday. WR: Braxton Berrios, Miami. Berrios had eight catches for 90 yards, and although he wasn't responsible for the game-winner at FSU, he was a clear difference-maker in the game. He caught Miami's first two TDs, one of which was set up by his 44-yard punt return. TE/FB/WR/Athlete/H-back: Jaylen Samuels, N.C. State. The versatile Samuels had another big game in the win over Louisville, finishing with seven catches for 104 yards, including a 79-yard reception. OL: Georgia. Viewed as a weakness entering the season, the Georgia O-line has exceeded expectations and continues to pave the way for a strong running game. Sony Michel (150) and Nick Chubb (138) both had big games as the Bulldogs racked up 423 rushing yards on 54 attempts in a 45-14 win at Vanderbilt. DL: Nick Bosa, Ohio State. The Buckeyes held Maryland to 66 yards, and Bosa set the tone early with a strip sack that Jerome Baker returned for a touchdown. Consider this a team award. DL: Bradley Chubb, N.C. State. In a game featuring the reigning Heisman winner, Chubb looked like the best player on the field. Chubb sacked Lamar Jackson on his first drop-back and had six tackles, two tackles for loss and a blocked PAT in N.C. State's win over Louisville. DL: Stacy Keely, UAB. After two years of not playing football, UAB scored a huge win over Louisiana Tech, which has won two of the past three C-USA West titles. The 23-22 win happened because Keely blocked a 30-yard field goal on the last play of the game. DL: Austin Bryant, Clemson. Bryant continues to be a superstar on a star-studded Clemson D-line. In the 28-14 win over Wake Forest, Bryant had seven tackles, two tackles for loss and a forced fumbles. LB: Devin White, LSU. White was a monster for the Tigers in their win over Florida, racking up 13 tackles, a sack and a pass breakup to help lead them back from their loss to Troy. LB: Khalil Brooks, Middle Tennessee. Brooks spearheaded a dominant MTSU defensive effort in a win over FIU, with eight tackles, five tackles for loss, three sacks and a forced fumble. DB: Minkah Fitzpatrick, Alabama. The versatile All-American had an interception in the red zone, five tackles, two tackles for loss, a pass breakup and a forced fumble in Bama's win at Texas A&M. DB: Tae Hayes and Clifton Duck, Appalachian State. Through six weeks, four players have had three interceptions in a game. Two happened to be on the same team in the same game: Hayes and Duck had three picks each to lead the Mountaineers to a 45-31 win over New Mexico State. DB: Max Regan, Army. Army blew out Rice 49-12 in part because it forced four turnovers in a six-play span in the first quarter. That included a 48-yard Regan pick-six for the Black Knights' first points, then a Regan forced fumble that set up another TD. DB: Brandon Snyder, Iowa. In his first game back after tearing his ACL just six months ago, Snyder intercepted a pass and returned it 89 yards for a touchdown. Illinois was trying to drive for a go-ahead score in the third quarter; instead, Snyder put Iowa ahead by 11, and it went on to win 45-16. DB: David Dowell, Michigan State. Michigan State upset Michigan mostly because it won the turnover battle 5-0 in rainy weather. At one point in the second half, John O'Korn threw an interception on three straight possessions. Dowell had two of them, and he also had seven tackles and a pass breakup. K/P: Adam Nunez, TCU. Big 12 games aren't usually known for punting being a deciding factor, but Nunez may have been the Horned Frogs' MVP in their win over West Virginia. He punted seven times and pinned WVU at its own three-yard line, five-yard line, one-yard line and six-yard line in a first half in which the Mountaineers scored three points. AP: Joel Lanning, Iowa State. The former quarterback has become a stellar linebacker for Iowa State, but he returned to playing some QB with Jacob Park out in the upset of Oklahoma. Lanning had eight tackles, a sack, a fumble recovery, 25 passing yards and 35 rushing yards. A+: N.C. State. After stumbling out of the gate in a loss to South Carolina, N.C. State has responded by beating both Florida State and Louisville, its first two wins over ranked opponents since Dave Doeren took over in 2013. The 39-25 win over the Cardinals on Thursday was a statement in which the Wolfpack were clearly the superior all-around team despite the presence of Lamar Jackson on the other side. Bradley Chubb and the defense have been terrific, Nyheim Hines has emerged as a productive tailback and Ryan Finley is one of the nation's most underrated quarterbacks, with 10 TDs and zero interceptions. N.C. State is ranked 20th in the latest AP poll, its first top-20 appearance in 14 years. A: Washington State. Yes, Oregon had to play a backup quarterback with starter Justin Herbert injured, but that doesn't take much away from what Washington State did in Eugene. The Cougars hadn't left home yet this season, winning their first five all in Pullman. That home stand ended with a the enormous win over USC. Tasked with following that up on the road in Autzen Stadium, Washington State avoided a letdown and crushed the Ducks 33-10, holding them scoreless in the final three quarters. The Wazzu defense played at a high level again, giving up just 277 total yards and 13 first downs. A: Texas. Perhaps Kansas State isn't as strong as expected -- the Wildcats lost to Vanderbilt 14-7, after all -- but Texas will take any confidence-boosting win it can get. Sam Ehlinger started at quarterback and threw for 380 yards and two TDs and rushed for 107 yards, a phenomenal performance by the freshman to lead the Longhorns to a 40-34 victory in two overtimes. Ehlinger directed a 12-play, 52-yard drive to set up a game-tying field goal late in regulation, and the Longhorns scored TDs on both of their OT possessions to win. A-: Georgia and Auburn. Another week with two blowout wins for the only teams that have a prayer of challenging Alabama in the SEC race. Georgia's ground attack steamrolled Vanderbilt in a 45-14 win in what appeared to be a home game away from home, and Auburn jumped out to a 35-3 halftime lead en route to a 44-23 win over Ole Miss. Both teams are 3-0 in SEC play. Georgia has outscored SEC opponents 117-17. Auburn has outscored SEC opponents 144-47. They meet in a month, on Nov. 11 at Jordan-Hare Stadium. B+: Wisconsin. The only team on Wisconsin's schedule currently in the top 25 is Michigan. The Badgers avoid Ohio State and Penn State (plus Michigan State) from the Big Ten East in the regular season, and they don't play the Wolverines until the second-to-last game. They're flying under the radar, quietly taking care of business against a highly beatable schedule. The latest win was one of their toughest trips: a 38-17 win at Nebraska, in a game in which they scored the last 21 points to win easily. The passing game is a concern, but the running of Jonathan Taylor (who had 249 yards) and the play of the defense should be more than enough to carry the Badgers most weeks in the Big Ten West. B: USC. After the loss to Washington State, the Trojans got a breather of sorts against Oregon State. Sam Darnold threw another interception, his ninth, but he also passed for 316 yards and three touchdowns in a game in which the Beavers didn't stand a chance. Three turnovers made for a somewhat sloppy USC performance, but it's hard to complain about a 28-point win. B-: Clemson. The 28-14 score in a win over Wake Forest made for a mostly forgettable result. The big question to come out of Saturday was the health of quarterback Kelly Bryant, who left the game with an ankle injury. The injury does not appear to be serious, but the Tigers are facing a short week before playing Syracuse on Friday. Bryant threw for 200 yards before leaving. In his place, Zerrick Cooper completed 2 of 6 passes for 16 yards, and five-star true freshman Hunter Johnson hit 5 of 5 for 42 yards, including a 13-yard TD pass to Cannon Smith. B-: Virginia Tech. The Hokies beat Boston College 23-10 on the road, which is exactly the type of result that happens in a road game against the Eagles: The superior team wins relatively easy, but the end result isn't particularly pretty. Josh Jackson threw a 53-yard touchdown to Sean Savoy early, and the Hokies stalled for three short field goals on drives into BC territory. C: LSU 17, Florida 16. Kudos to LSU for bouncing back from a devastating home loss to Troy. This is an increasingly heated cross-division rivalry, and what happened last week in Death Valley to LSU made this even more excruciating for Florida at home in the Swamp. It proved to be a close game with no turnovers, and the game was decided on a missed PAT in the third quarter. Ultimately, 33 total points was about exactly what anyone expected from this game between two clearly flawed teams that still don't inspire much confidence. So, the game gets a "C." The Ben Hill Griffin Stadium tribute to Gainesville native Tom Petty? That gets an "A." D+: North Carolina. The Tar Heels are a regular in this space. Losing to Notre Dame? Excusable. The Fighting Irish are far better than they were in 2016, already topping their previous win total. But UNC lost 33-10 despite the fact that the Irish had to play backup QB Ian Book with Brandon Wimbush out. Chazz Surratt averaged just 4.3 yards per pass attempt, and the Tar Heels' ground game went nowhere. Two years after leading the nation in yards per play, winning 11 games and finishing in the AP top 25 for the first time since 1997, the Tar Heels are 1-5 and rank 91st in yards per play. They still have to play Virginia Tech, Miami and N.C. State, too. D: Arkansas. It's already feeling like a lost season for Bret Bielema and the Razorbacks. In a presumably evenly matched road trip to South Carolina, Arkansas lost 48-22, losing the turnover battle 4-0 and struggling to run the ball. Incredibly, three of those turnovers -- two picks and a fumble -- were returned for South Carolina touchdowns in the second half. Arkansas is 2-3 overall an 0-2 in the SEC, and its next two games are against No. 1 Alabama and No. 10 Auburn. D-: Tulsa. The Golden Hurricane went 10-3 in Philip Montgomery's second season, and although they lost some key players, they had hopes of being AAC West contenders again this year. Instead, they're 1-5, owners of one of the nation's worst defenses. After losing to Tulane -- a team on the rise under Willie Fritz -- 62-28, Tulsa has allowed over 40 points four times. It ranks last nationally in defensive passer rating, and after playing three games against prolific option attacks -- New Mexico, Navy, Tulane -- it ranks last in rushing yards per game allowed. It all adds up to ranking 130th in yards per play allowed, as well. According to Sports-Reference, it's the first time any FBS team has allowed over eight yards per play in its first six games since at least 2000. Tulsa has already allowed more total yards than Michigan did all of last season. F: Maryland and California. Cal can feel better about its performance against Washington by gazing at Maryland's box score against Ohio State. In a 38-7 loss to the Huskies, the Golden Bears finished with 52 plays for 93 yards, an average of 1.8 yards per play. That included -40 rushing yards thanks in part to nine Washington tackles for loss. Cal's one touchdown came on a fumble return TD. But somehow, Cal played better than Maryland, which lost to Ohio State 62-14. Yes, the Terps were down to third-string QB Max Bortenschlager, who completed 3 of 12 passes for 16 yards, but they did beat Minnesota on the road with him last week. Maryland ran 55 plays for 66 yards, an average of 1.2 yards per play, and it has lost its past two meetings with the Buckeyes by a combined score of 124-17. 1. No. 12 Oklahoma vs. Texas. The Red River Rivalry took a hit when the Sooners lost to Iowa State, but Lincoln Riley vs. Tom Herman, Part I, can't help but be intriguing. 2. Georgia Tech at No. 11 Miami. After winning at Florida State, Miami needs to refocus and shut down Georgia Tech's option attack in a big ACC Coastal home game. 3. No. 10 Auburn at LSU. Auburn is on a hot streak, but now it needs to win in Death Valley for the first time since 1999. 4. Utah at No. 13 USC. A trip to Notre Dame is on deck for USC. First, it has to win a home prime-time game against a solid Utah defense that will challenge QB Sam Darnold. 5. Boise State at No. 19 San Diego State. Boise State hasn't been great this season, and yet this is still the hardest remaining regular-season game for the 6-0 Aztecs. 6. No. 6 TCU at Kansas State. It's not been a great start to the season for Kansas State, but would anybody be shocked if Bill Snyder and the Wildcats' ended TCU's unbeaten run in the Little Apple?